Over the last few months I have come across two great breakfast recipes, one hot and one cold. We had another potluck at work but this time we decided to do something a little different and have a breakfast instead of lunch. Well, one of the ladies on our team is on a gluten free diet, so I thought it would be nice to make something that she could enjoy. Conveniently, a few weeks earlier I came across a gluten free breakfast bake on Pinterest that I had saved! The cold breakfast I have been eating for a while and I found back when I was just looking for an easy, low calorie breakfast to have at work. The original recipe called for almond butter, but that was just too pricey and had too many calories for my taste - so, I decided to substitute it with apple butter and it worked out great. Generously spray the inside of a 10 1/2" x 7" baking dish with cooking spray and place on a baking sheet. In a large bowl, mix together the oats, sugar, baking powder, cinnamon, salt, half the walnuts, half the berries, and half the chocolate. In another large bowl, whisk together the milk, egg, butter, and vanilla extract. Add the oat mixture to prepared baking dish. 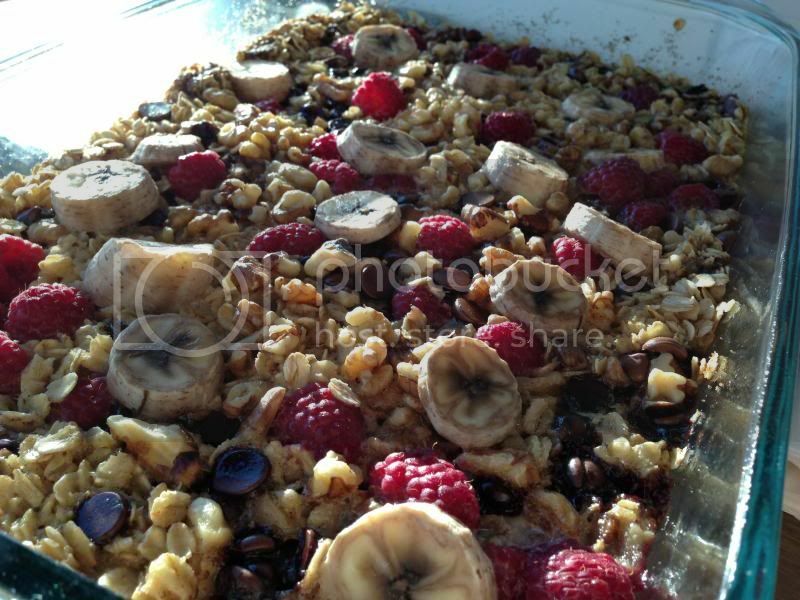 Arrange the remaining berries, walnuts and chocolate on top. Add the banana slices to the top then pour the milk mixture over everything. Slice the banana length wise (so it's like a banana sandwich). Spread about a tablespoon or so of the butter on the inside of both banana slices. Cover the outside of the banana with the coconut. Wrap in wax paper and then in plastic wrap. Place in the freezer at least overnight. I make a bunch of these a week and then every morning put one in my lunch bag. By the time I get to work and settle in, the banana is still plenty cold but has also warmed up enough to slice and eat. I am the lucky gluten free recipient of this fabulous oatmeal bake from work - and I can testify that this dish is out of this world! Delicious!